HSM, the global manufacturer of components and provider of integrated solutions to the transportation, furniture, bedding and a growing number of diversified markets, will introduce its Transitional™ Sleep Systemadjustable bed foundations at the ISPA Expo, March 26-29 at the New Orleans Morial Convention Center, New Orleans, La. Two models in the system – the TS100 and TS200 – will be on display in the HSM booth #1007. Both the TS100 and TS200 adjustable bed foundations are made in America, manufactured in HSM factories using HSM made-in-America components. For HSM customers, this means the ability to carry just-in-time inventory. "In addition to financial advantages, smaller, more manageable inventories make it easier for our customers to customize the foundations," said Todd Councilman, vice president, HSM Bedding Solutions. "They are free to change out the look of the product with fabric choices, multiple leg styles and finishes, as they differentiate themselves in the marketplace and adapt to changing trends, consumer preferences and demographics." HSM will limit sales of the Transitional Sleep System to original equipment manufacturers. "The TS100 and TS200 are designed to support OEMs, providing them with adjustable beds to marry with their current product offering," Councilman explained. "Our goal is to support our OEM customers and not sell direct to retail. To that end, we are offering owner's manuals that can be customized with the OEM’s specific brand information." 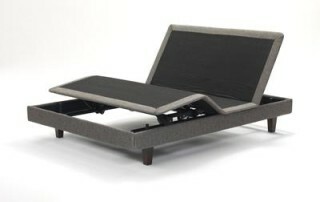 A product of the HSM Corporate Innovation and Technology Center and the company’s new, disciplined approach to innovation and product development, the Transitional Sleep System adjustable bases offer a variety of features and benefits, including head/foot articulation, remote control and pre-set positions for optimal comfort and support for watching television, working on laptops and lounging. A Zero-G position elevates legs slightly above the heart to help relieve lower back pressure. In addition to the features available in the TS100 base model, the more robust TS200 offers wireless remote control, a dual massage option, undercarriage LED lights and a wall/headboard flush design that keeps bed occupants in close proximity to nightstands, even when the head of the bed is raised. "These are lifestyle products meant to accommodate changes to the way the bedroom is used," noted Rick Anthony, director of sales, HSM Bedding Solutions. "People are spending more time in bed, not just sleeping, but relaxing, watching television and using their electronic devices. So, adjustable beds are no longer viewed as a medical solution or a convenience for the aging. They represent a comfort solution that allows anyone to adjust their bed to their lifestyle." To learn more about the new HSM Transitional Sleep System, visit www.transitionalsleep.com or visit booth #1007 at ISPA.